When you think of traditional Italian food, what comes to mind? Homemade tomato sauce. Fresh mozzarella. Mouth-watering pastas and pizza. At Molino’s Italian Kitchen, the hottest Italian restaurant in Manalapan, NJ, you’ll find that and more! Whether you’re in the mood for some of the best pizza in New Jersey or you’re looking for a full menu featuring traditional Italian food made with the finest ingredients, Molino’s Italian restaurant will exceed your expectations every time. With long-standing family roots in authentic Italian cooking, we expertly prepare all our dishes with the perfect combination of flavor, quality ingredients and love that you’d expect from one of the best Italian restaurants. Isn’t it time you had a taste of the old world right around the corner? From our homemade pizza dough and specially made fresh mozzarella from Wisconsin, to our high-quality beef, chicken, veal and seafood, you can expect a memorable dining experience each and every time you’re here. 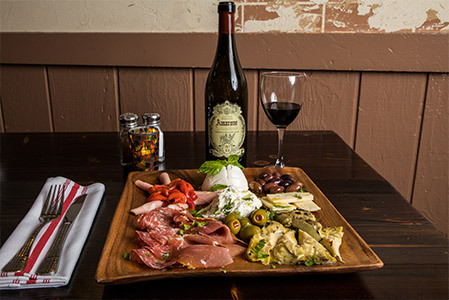 Experience traditional Italian food and homemade recipes at Molino’s: Just Simply Good Italian Food! Visit us today at 300 Gordons Corner Road, Manalapan, NJ, in the Yorktowne Shopping Center.